One of my favorite things about shopping in a used a bookstore is finding a book that has an inscription. Whether it be a name or a note, a handwritten inscription gives my sense of curiosity a jolt. It’s like I’m getting two stories for the price of one! 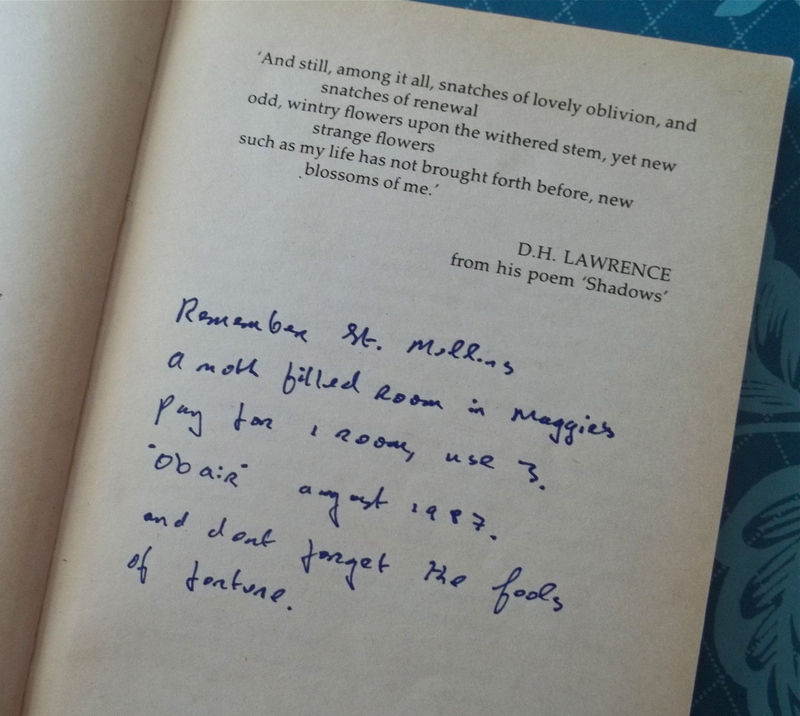 During my travels around the world and frequent visits to local used bookstores, I’ve come across my fair share of inscribed books. However, there are a few that really stick out in my mind as being the most interesting. I came across this book at used book fair shortly after starting my career as a teacher. When I opened it up and saw the inscription, I knew it was kismet that brought me to this book. The inscription in this book has baffled me from the very beginning in that I don’t know if it is quoted material from a known writer or if it is a memory written by a poetic soul. Either way, I find it to be a hilarious beginning to a great story. If anyone recognizes these lines, please let me know in the comments! I’ve done everything from library to google searches and have come up with nothing. When I first picked up this book, I thought it would be a nice weekend read. After opening the cover and reading such a wonderful letter the book instantly became more meaningful to me as I travel the path of a writer. Wherever Laura is now, I hope she is living out loud! 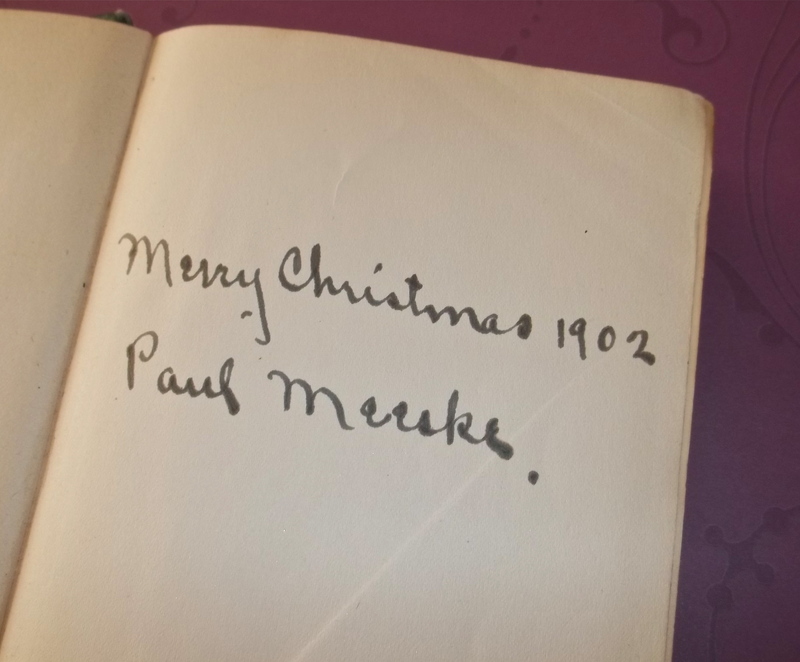 I’ve always loved this very simple inscription, because 110 years ago someone got this book as a Christmas gift. I can’t help but wonder how that particular Christmas was celebrated and who the lucky recipient was of such a nice gift. 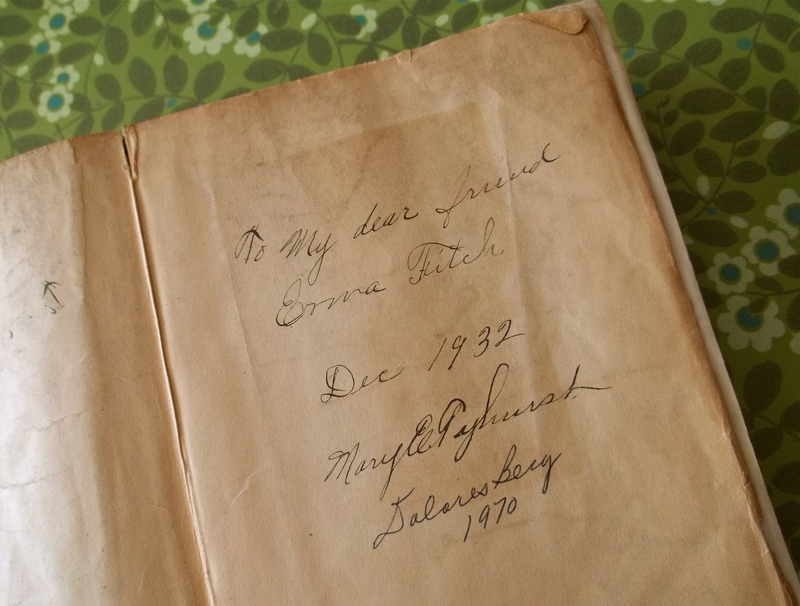 Aside from used bookstores, I’ve inherited a number of books with inscriptions. Sometimes the signatures relate to past and present family members, while others do not. Either way, they are very special to me as I remember seeing the writing in these books as a child. This book sat on my grandparents’ bookshelf the entire time I was growing up. I must have read it dozens of times! I wonder if Edward practiced the way Mary hoped he would. My grandmother owned this edition for a long time before handing it down to my aunt, who then gave it to me. 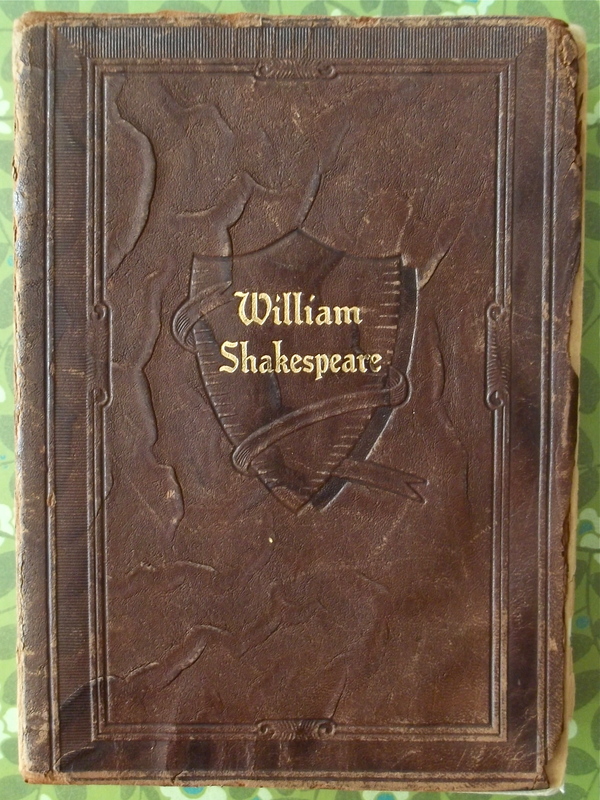 It’s one of my treasured possessions as I love Shakespeare and the history that has gathered in the pages of the leather-bound beauty. I love it when a list of names fills up the first page of a book like a family tree of sorts. My grandmother held this book in her hands when she was a little girl. I’ve had it since I was about 13 years old and have somehow managed to keep an inscribed loose page from wandering off! Every book on my shelf has a story, but those with ink-stained pages are the ones I love best. Special Note: You don’t have to squint to read these fantastic inscriptions. Click on any image for a full-size view! These are fantastic, my Dad and I inscribe books we gift to each other. Makes the book more more special. I recently found a secondhand copy of A Farewell to Arms. Someone typed a note and taped it to the inside cover, these are the good bits: Dear Olivia, Ernest Hemingway writes in a deceptively simple style. It will be worth your while to read this evocative book. It is a tragic love story that is most haunting… (it’s signed, but I can’t read the people’s names!) I’m intrigued! I have hope that inscriptions will give real books an advantage over e-readers for a long time to come! I, too, found St. Mullins in Ireland, but the word “obair” has been a struggle to find. Thanks for offering up a nice definition. Maybe another piece of the puzzle has fallen into place! I’ve done a search for Maggie’s in St. Mullins, but nothing came up. I didn’t expect it would, but it was worth a shot!! Am I being too optimistic in hoping the person who wrote this inscription will see it and shed some light on the story?? Lol! Also, Fools of Fortune was a book published in 1983 about an informer’s body that is found on the estate of a wealthy Irish family shortly after the First World War. You can read about it on Goodreads http://bit.ly/QX8dCh. It was also made into a movie in 1990. I’m wondering if the ‘fools of fortune’ might be a reference to this book. Yes, yes. The more I think about it, the more I think there is a hidden message in this inscription. So cool. Maybe. I’ve seen the phrase in other places, but this does make for an interesting way to interpret the inscription! Absolutely brilliant! 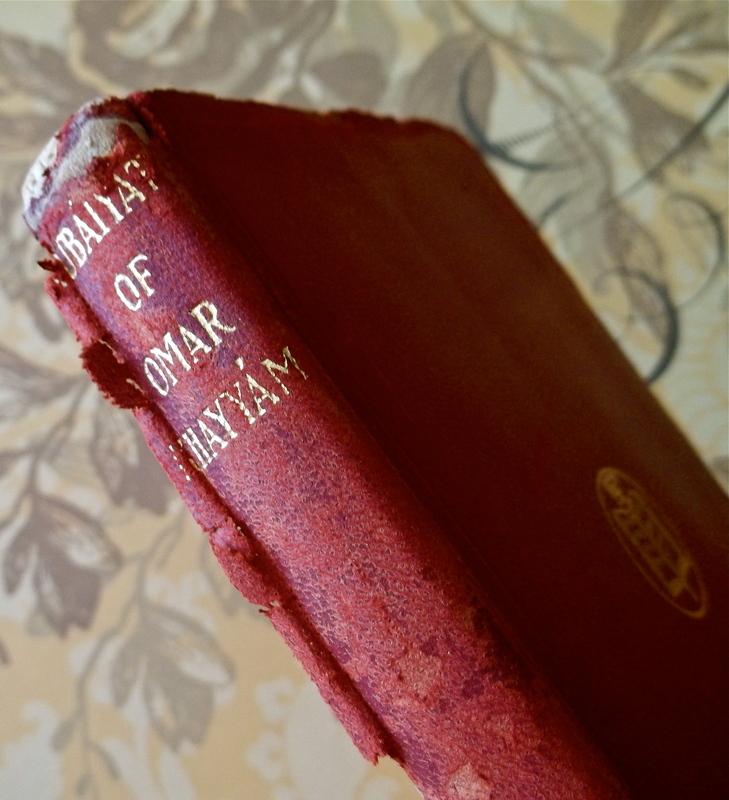 I love old books, and when they have inscriptions, it’s ten times better 🙂 I’m heading to London and Edinburgh in a week, do you have any shops you’ve hit that you can recommend? Oh, fun! In London, definitely make your way down to Charring Cross Road. You’ll fin one bookshop after another lined up on a huge portion of Charring Cross. Wander into exceptional used bookshops, but also make sure you stop by Foyles, (one of the best bookshops I’ve ever visited!). While walking down Charring Cross, look for a little side street called Cecil Court. Its filled with amazing antique and used bookshops! Well worth a peek! What a wonderful collection – interesting the concept that you get “two” books for the price of one. 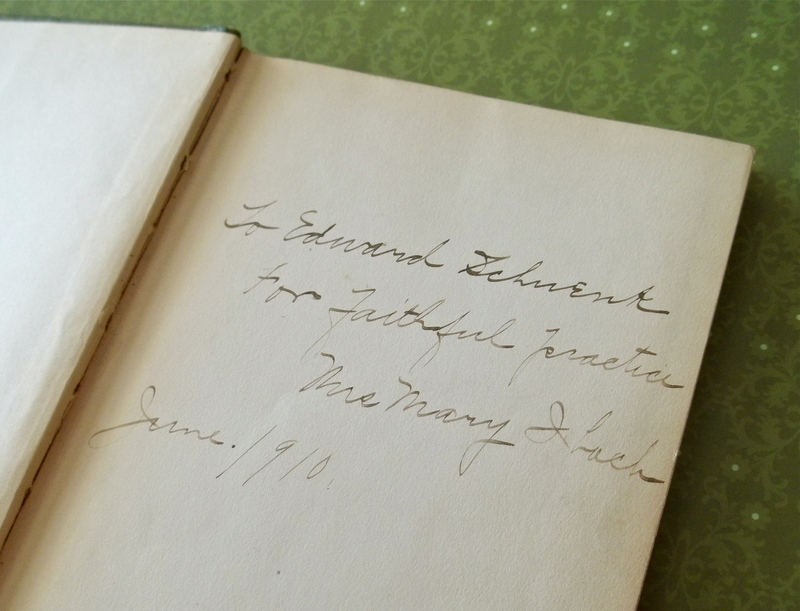 I find it difficult to give books away when they have been inscribed – especially now. Very nice blog idea! I’ve got to check some books on my shelf. Beautiful! I always find books so inspiring – classic books, new fiction, cookbooks, empty notebooks… I am so opposed to the whole ‘don’t judge a book by its cover’ thing. I can’t resist a beautiful book! Your comment reminds me of a cookbook I forgot I had! I have an old (19th century) cookbook where the previous owners scribbled adjustments to the recipes. It’s absolutely fascinating! I can understand why theses inscriptions would pique your interest. Like me, you are fascinated with reading headstones-whatever tells a story! What about looking through items in a lost and found box at a gym or museum? That is so much fun! Things are left behind in my classroom all the time. I’ve come across some pretty strange things! I will never look at a book inscription the same way after reading this post. 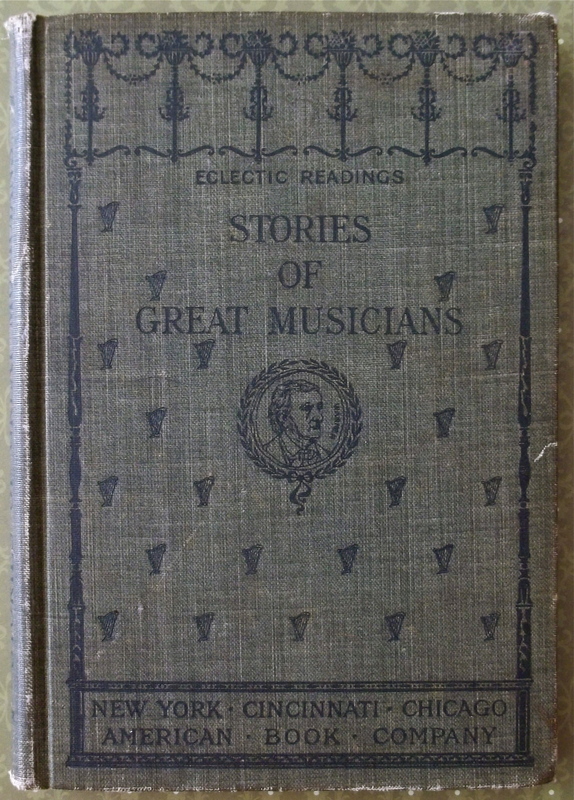 You are right–two stories for the price of one, although the inscription probably requires a bit more imagination. Using my imagination is the fun part! 🙂 And the story changes every time I see the inscription – it’s a gift that keeps on giving. luv! Isn’t it curious how all the cursive has the same sweeping feel to it? I’ve heard that around here they are actually not teaching cursive anymore. I do adore finding inscriptions in books, though, sometimes I’m amazed that they are given away after such personalization. I, too, wonder how people give away books that have been inscribed. Even if I don’t like a book, I still keep it if it was a gift inscribed to me because it reminds of the person who was kind enough to give it to me. This was such a fun post to read and ponder. You have such treasures of family history, and the inscriptions by unknown hands create so many possible stories and characters before you even open the book. It seems a little sad that these inscriptions are now distanced from anyone for whom they had meaning. They have become like archaeology. 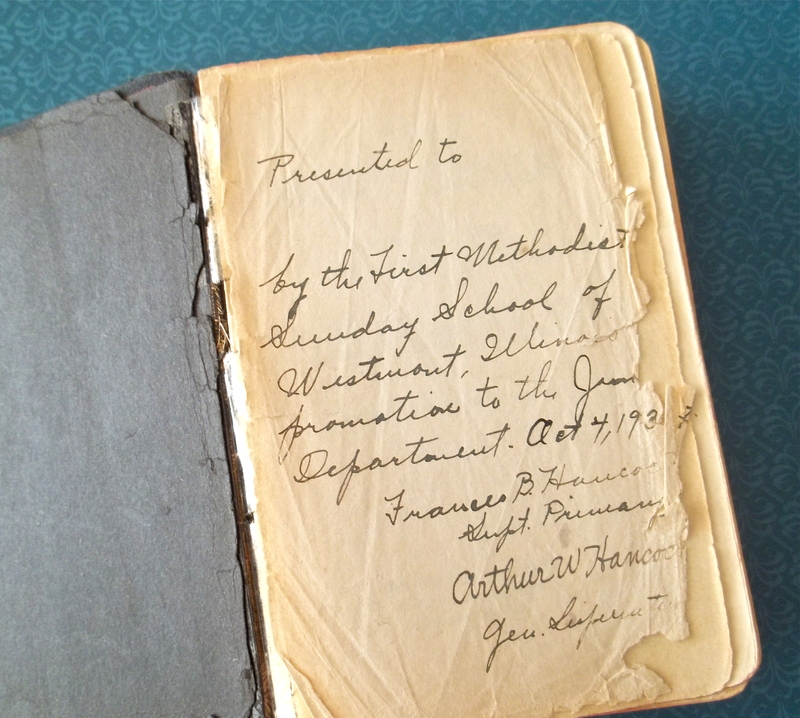 I think there is room for an on-line repository of inscriptions from second-hand books. Maybe you and I should start a second blog. You never know, someone surfing the web might come across an inscription and exclaim, “But that’s my great aunt!” If not, then they are a part of social history that needs to be preserved. I also love inscriptions. They make me wonder about the journey the book has been on and how it has managed to find its way to its current spot. If only those books could talk! Great post. I know! 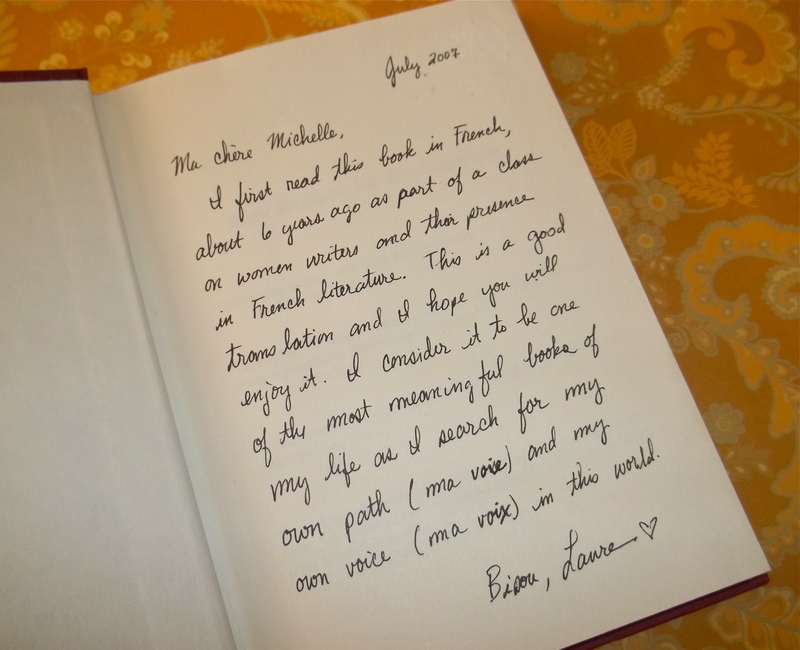 Sometimes I wonder how the book ended up in a stranger’s hand, especially with a personalized inscription. A fantastic post! I just love these..I have a passion for old postcards, reading and imagining the stories behind the characters..I love this idea and have never thought to look before.., thanks for sharing these! It also brings back warm memories of my Gran who always write inscriptions in books..you just cant do that on an ebook.. I didn’t know I had so many until I started lifting the covers on my books. I was so surprised to find so many, (I couldn’t even consider putting all of them on this post!). Treasure awaits you on your bookshelves! I’m a sucker for a used book store, although since moving aboard so many years ago, I have scant room to collect. Used books have a life and an energy that new books simply can’t compare, although, all used books started life, at one time, as new. I love inscriptions as you do, they are a window into mysterious worlds, of lives we can only guess at, and thoughts we grasp to perceive. Thank you so much for these gifts. Both the historian and writer in me is hopelessly drawn to the mystery you’ve described. I hope we never lose that sense of wonder. I love when I purchase a book and it has an inscription. It makes a book even more special. Thanks for sharing this. I wonder the same thing. I have a habit of inscribing books I give to people and I can’t help but wonder what it will seem like to someone who comes across it 100 years from now. What a great way to begin your reading of books – now I must think to look at the inscriptions more closely! 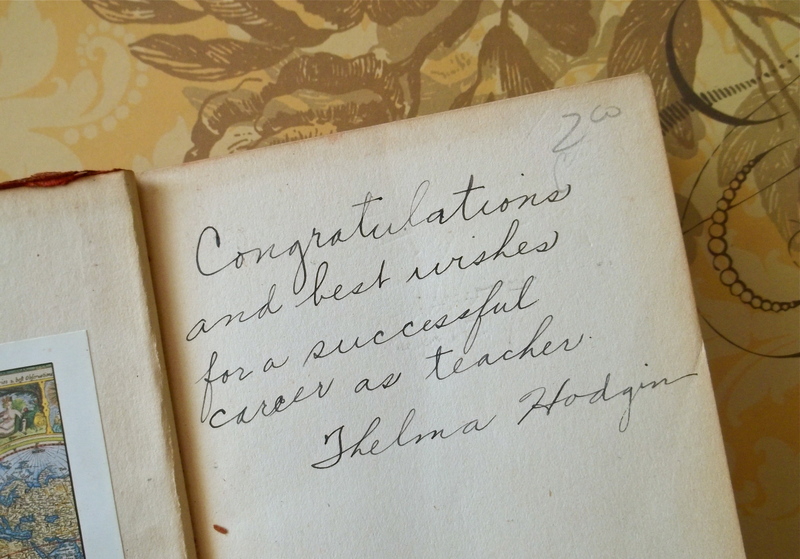 There is something so endearing when I find a book with an inscription or an old photograph, I wonder who and where those people are now. It becomes a story unto itself. Well a wonderfully simple blogpost, with so much heart attached. Thanks for sharing. Although, to be honest, I couldn’t read one or two.